Steven (Chicagoland, United States) on 19 January 2016 in Landscape & Rural and Portfolio. Carcross Desert, located outside Carcross, Yukon, Canada, is often considered the smallest desert in the world. The Carcross Desert measures approximately 1 square mile, or 640 acres. 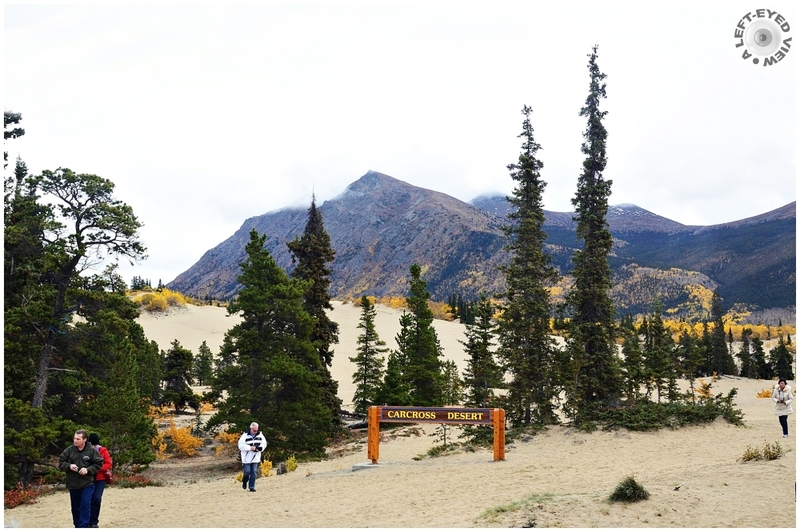 Carcross Desert is commonly referred to as a desert, but is actually a series of northern sand dunes. The area's climate is too humid to be considered a true desert. The sand was formed during the last glacial period, when large glacial lakes formed and deposited silt. When the lakes dried, the dunes were left behind. Today, sand comes mainly from nearby Bennett Lake, carried by wind. The dunes contain a wide variety of plants, including unusual varieties such as Baikal sedge and Yukon lupine, among others. The Yukon Territorial government made efforts to protect Carcross Desert in 1992, but failed due to opposition from locals who use the dunes for recreational purposes. Photo captured September 15, 2015. I suppose there are off road vehicle tracks everywhere. A beautiful shot of the 'desert'. Un endroit qui donne envie d'en faire un peu plus ..
What a fascinating story to go with this . . who could have guessed ?! Beautiful composition. The color of the sand is superb . A nice mix of everything here.... mountains, trees, sand. There is a similar place in Manitoba called 'The Spirit Sands' desert which was created 16,000 yrs ago from a glacier. I remember our visit there and trudging through the sand. A super landscape shot Steven.... and great info! an interesting and fascinating whim of nature! i find a bit short sighted to use these dunes for 'recreational purposes'; what can it mean? going up and down them in dune buggies ?!? Ces sapins droit et cette entrée ces eprsonnage et les montagnes sueprbe. I would have thought the surface was snow if you had not clued us in. A fine shot of this unusual place. Interesting....I am a Canadian and didn't know that so thanks for the geography lesson. Very interesting description of the place. And very nicely documented with your image. Interesting information. It is surrounded by lovely mountains. I would like to visit that small desert. A nice view with a good compo. Ces arbres immenses sur fond de sable et de montagnes arides forment un paysage étrange ! The information was really interesting! That is such a small desert. It is a shame that it could be ruined by dune buggies. A beautiful view! Once again, very nice shot and the information is excellent.